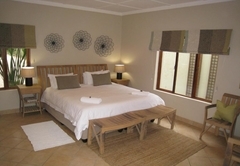 Apple Cottages is a property providing self catering in George for tourists visiting the Garden Route region. 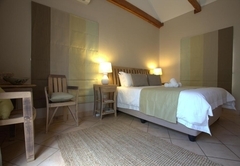 Apple Cottages offers accommodation in three luxurious self-catering cottages, situated in the city of George, on the beautiful Garden Route of South Africa. 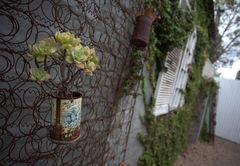 All of the cottages are modern and functional and will appeal to leisure and business travelers alike. This unit has one bedroom and contains an extra-length queen-size bed and an en-suite bathroom. 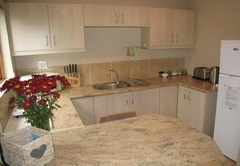 The open-plan kitchen is well equipped for self-catering and is fitted with a fridge, microwave, and a two-plate stove. Tea and coffee is provided. The bathroom is fitted with a shower and pure cotton bath towels are provided. 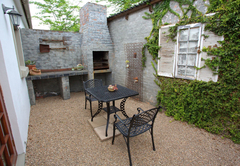 Each unit has its own private braai facility. 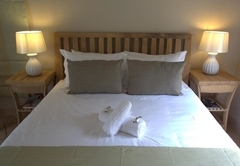 This unit features one bedroom, with twin extra-length single beds that can be converted to a king-size bed on request. 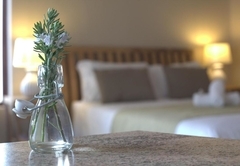 The en-suite bathroom is fitted with a shower and pure cotton bath towels are provided. 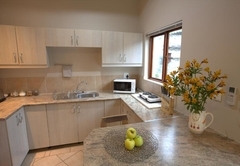 The open-plan kitchen is well equipped for self-catering and is fitted with a fridge, microwave, and a two-plate stove. Tea and coffee is provided. 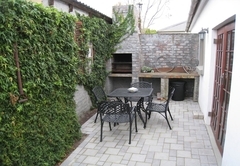 Each unit has its own private braai facility. This is our family unit and can accommodate up to two adults sharing with two children. The main bedroom contains one extra-length queen-size bed, and there is an additional room with single extra length bed. The bathroom is fitted with a shower and a bath. Pure cotton bath towels are provided. The unit has a separate kitchen and lounge and there is another single extra length bed in the lounge. The kitchen is fitted with a fridge, microwave, and a full oven. The unit has its own private braai facility.